an award we would have done so, as their help at so many club events is invaluable. 2014 Club Indoor Champions are: Gents Recurve: Ciaran Murphy; Ladies Recurve: Caroline Buchanan; Gents Longbow: Jonathan Howlett; Juniors: Ruth Porter. 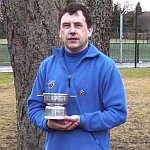 Congratulations to Ciaran Murphy who won the Glenlivet Frostbite Quaich on 3rd February.